The foundation of the structure is the themes, which are recurring main melodies and the principal musical ideas that the composers tried to convey. On this foundation, the composers will add interesting details and variations of the themes. The most familiar form is the sonata form which consists of three parts: the exposition, the development and the recapitulation. The exposition introduces the main themes. Usually, there are two main themes, the first theme (subject) is usually rhythmical and bold; it is sometimes referred to as having a masculine character. This then leads to a transition section which uses material from the first theme and transposes into the key of the second theme (subject), which is generally the dominant, or the relative major or minor of the home key. The second theme is usually more feminine in character, being more melodious and lyrical. When this is over the section ends in a codetta and leads straight into the development. In the development part, the composer will show his skills to create more complicated music and add new passages occasionally. These skills include changing the key, changing the length, cutting themes in half, repeat a phrase in ascending keys (sequencing), change the chord harmony but keep the melody, etc. The recapitulation returns to the tonic key and the thematic material of the exposition, except that there might be some variations in the harmony. The structure and form of the music are so complex that it will take years of training in music theory and history to understand. This discourages most people to go deeper in analyzing the music though people still enjoy listening to the classical music. There are summaries of the structure and forms on the Web (see these links: Music form, A Beginner’s Guide to Sonata Form, Sonata Form). UCLA researchers in the Electron Imaging Center for Nanomachines (EICN) core lab at CNSI have found a pattern in a virus that appears to rhyme with one of Mozart’s piano sonatas. Upon learning about the virus assembly, the team also discovered that the sequence in the assembling viral protein and RNA molecules appears to rhyme with the first several measures of Mozart’s piano sonata in C-Major (K545). Fig. Formation of the bullet tip of VSV virion by the nucleocapsid (N) ribbon. Here is the video of the 3D animation of the virion trunk, as seen from the central cavity. (This requires Quick Time Player). The nucleocapsid (red) and the matrix (pink) are rotating around their helical axis. The background music is from Mozart’s piano sonata in C-Major (K545). Scientists and musicians have designed various programs and software to help people in visualizing the structure in classical music, e.g., Arc Diagram, Isochords, and ImproViz. Commercial software also are available, e.g., TimeSketch, Music Animation Machine and Hyperscore. I will discuss these programs/software in the coming posts. It takes years of training to read conventional music scores. Music Animation Machine is designed to help people get the same information in an easy way by watching the video display. The music’s structure is conveyed with bars of color representing the notes. These bars scroll across the screen as the music plays. Their position on the screen tells you their pitch (vertical) and their timing (horizontal) in relation to each other. Different colors denote different instruments or voices, thematic material, or tonality. Each note lights up at the exact moment it sounds. I found MAM is a great tool to see the inner structure of music. Here is a YouTube video of Music Animation Machine working on Vivaldi’s Winter, Allegro (Four Season). Here is a YouTube video of Animation Machine working on Bach’s double violin concerto in D major, first movement. Here is a YouTube video of Animation Machine working on Beethoven’s Symphony No.9, third movement — a more complex structure than the above strings only music. Formation of the bullet tip of VSV virion by the nucleocapsid (N) ribbon. (A) Fitting of the crystal structure (7) of nucleoprotein (N) (yellow ribbon) and RNA (blue ribbon) into the cryo-EM density map (semitransparent green, displayed at a threshold of 1.5 σ above the mean) from the VSV virion trunk. The helical axis in this panel points toward the reader. The purple wire frames represents the highest-density regions of the cryo-EM structure (threshold of 3.5 σ above the mean), which colocalize with α helices and the vRNA of the crystal structure. (Insets) Along the upper part of the interface between adjacent C lobes in the decamer, there are six hydrogen bonds (including R309 to E419) and one (I237:Y324) hydrophobic interaction (top right inset). After flexible docking of the atomic structure from the decamer into the cryo-EM density map of the trunk, distances between amino acid partners in these seven sites increase by ~9 Å, disrupting these interactions. 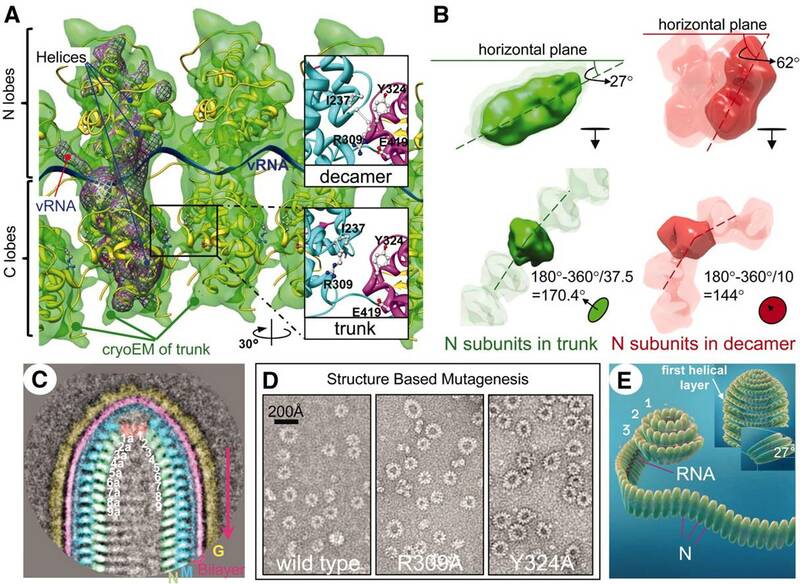 (B) Comparison of the inclination of N subunits (green) in our cryo-EM structure from the trunk of the virion (37.5 subunits/turn) with the inclination of the N subunits (red) in the crystal structure from the decamer ring (10 subunits/turn) (7). (Top) Dashed lines through a side view of an N subunit from the trunk (left) and with an N subunit from the decamer (right) show the difference in tilt, the angle up from the horizontal plane. (Bottom) Dashed lines through end-on views of N subunits show the difference in dihedral angle between adjacent N subunits in the trunk (green) and in the decamer ring (red). (C) A representative class-average of the virion tip from 75 individual images. Numbers inside the nucleocapsid designate the order of N subunits in the nucleocapsid ribbon, which may be traced by following the path 1 > 1a > 2 > 2a, etc. (D) Negative-stain EM images of the wild-type decamer and two mutant rings confirm the importance of two of the interactions specified above. Both mutants produce rings larger than a decamer. (E) An illustration of a plausible process by which the nucleocapsid ribbon generates the virion head, starting with its bullet tip. The curling of the nucleocapsid ribbon generates a decamer-like turn at the beginning, similar to the crystal structure. When assembly nearly completes this turn, continuation of vRNA requires that the ribbon form a larger turn below it, similar to that in the mutants in (D). As the spiral enlarges and progresses to the helical trunk, the tilt of individual N subunits decreases. When it reaches the seventh turn, the nucleocapsid ribbon becomes helical (insets), in which each new turn of the nucleocapsid fits naturally under the preceding turn (insets). This blog used “Twenty Eleven” Theme from WordPress.com.